We have been notified by our vet that the owner of Gracie has decided to euthanize her on Friday, March 2, if we cannot find a home for her. Please pass this email on to ALL your horse-loving friends. There might still be that special soul out there who sees into Gracie’s heart and her desire to spend a few more years on this planet as a companion horse. She is only 9 years old and has a heart of love in her. Gracie cut her tendons and ligaments in her inside hind left leg and has scar tissue in her tendon sheath, so her leg is not overall as strong. She wears a special shoe to help support her foot as she attempts to gain strength. Conservative treatment is the special shoe plus controlled exercise. The special shoe helps support the fetlock so it does not drop as much and cause more strain on the tendons. She would need it for a while, possibly forever. She walks O.K., but she is sore on that leg and will rest it requently. She does like to lie down, too. She would need a relatively small, but larger than a stall, flat area to walk around in and some sort of shelter. She is not taking bute now but may need periodic doses for pain management. 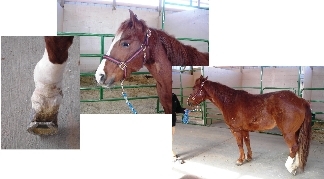 There is no prognosis for soundness now, so she is suited for companion animal, family pet or possibly a brood mare. She could not be put into a hilly pasture with other horses because she probably could not cope. It will take a very special human to care for Gracie, to make her comfortable and give her the love and companionship she needs. We know there is one out there. To stand next to this gentle creature and feel her beautiful presence is already a gift. She radiates a quiet strength.